Berlin attraction-guides.com - Berlin, Germany attractions guide Berlin Botanical Garden and Museum information about attractions, Botanischer Garten und Museum in Berlin Area, Germany DE, acres / hectares, hothouses and greenhouses, exotic plants and collections, gardens and planting, Botanical Museum, location and address, Konigin-Luise-Strasse, tel / telephone number, and general tourist information about Berlin Botanical Garden and Museum (Botanischer Garten und Museum) attraction in Berlin area, Germany DE Deutschland - Last updated 30/10/2012. The Berlin Botanical Garden covers over 108 acres / 43 hectares and is home to more than 20,000 different species of plant from all over the world. 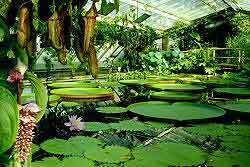 There are enormous hothouses and also 16 magnificent greenhouses, which offer a wealth of exotic plants and each greenhouse focuses on a different climate region. The gardens are over 100 years old and are beautifully arranged. The grounds are also home to the Botanical Museum, which provides scientific background information about plants. The stunning gardens are a 15-minute walk east of Dalhem-Dorf (U1) U-Bahn station.